Besides his work as an attorney and an author, Jeremiah Healy was a U.S. Army [veteran], and was also a lover of dogs. We have therefore reached out to a service dog organization in Maryland that trains dogs to assist wounded veterans, and they will be thrilled to receive donations in Jerry's name. The group is called Hero Dogs, and is based in Maryland...They are an IRS approved 501(c)(3) organization and operate entirely on donations. You can donate via their website, or by sending a check to Hero Dogs, P.O. Box 64, Brookeville, MD 20833-0064. But *please* ensure either by writing on the memo section of your check, or using the form on their website, that you're making this donation in Jerry's name. That way, Hero Dogs can track how many donations come in, so that they can be used in some way to keep Jerry's memory alive in years to come. Please donate what you can, and please share this link. Thanks to all of you who were friends or fans of Jerry's. 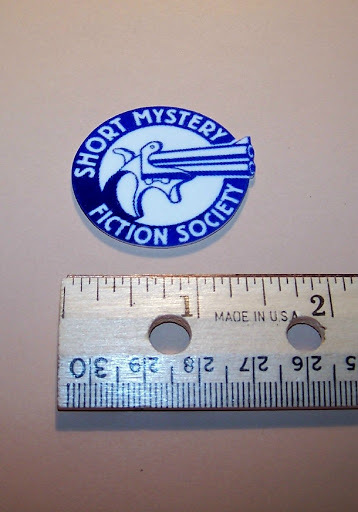 Artist John Moody drew the Short Mystery Fiction Society logo in 2003. Its derringer represents the Society's Derringer Awards, which date back to 1998 annually honoring outstanding published mystery & crime short stories up to 20,000 words, living writers' outstanding bodies of work, and people who've greatly advanced or supported the form. The lapel pin pictured at right was designed by Pattie Tierney in 2009. Order by emailing PATTIE dot TIERNEY at GMAIL dot COM. The cost is $12, which includes postage, payable by check or PayPal. Members may show the logo on their websites. To vote, you need to be a group member able to log into the particular Polls webpage with your Yahoo! ID and password. If you're a member but can't log in, you need to enable Web access. Click on the circle to the left of your choice. This fills the circle with a white checkmark against a green background, the record of your vote. If you want to change your vote before polling ends, return to the poll page and click on the circle to the left of your new choice. The white checkmark and green background will move accordingly.